It is believed that Eric acquired this in the 1960s. The medium is a composite cloth collage on a painted board. It is currently unframed. Dimensions are 54″ x 38″. Some might consider the style to be Cubist Figural. 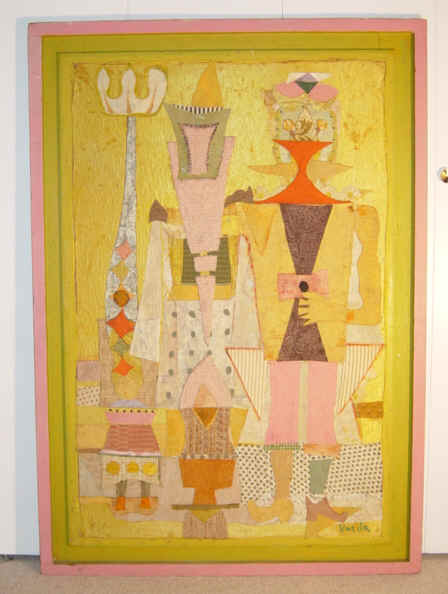 As indicated, it is believe Berne bought this directly from Jean Varda while Berne was living in Carmel. After Berne’s death, the work remained in his family. Although this piece is not specifically for sale, the owners would love to see this work in the hands of a collector or museum who can truly appreciate this piece. Contact us at webmaster@ericberne.com for more information.